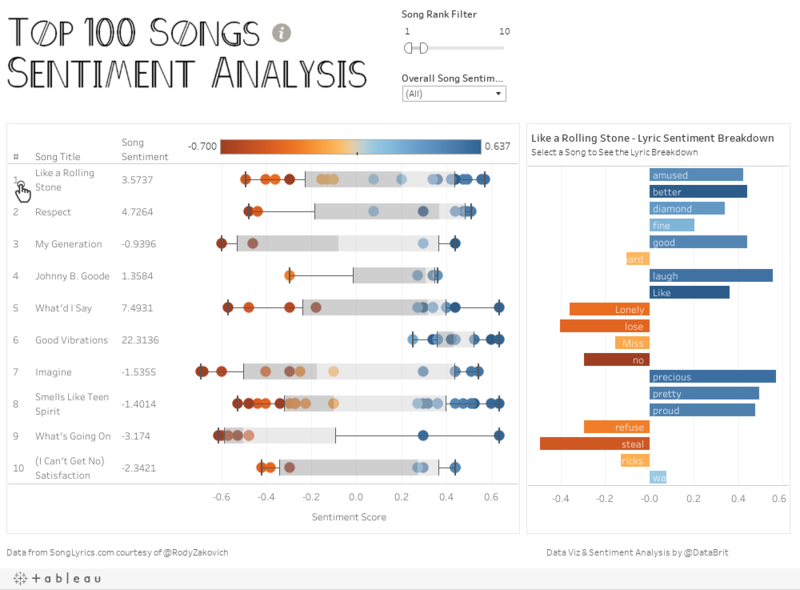 A recent Makeover Monday data set was on the top 100 songs' lyrics. I'd been eager to try Tableau's new TabPy feature, and this seemed like the perfect opportunity. I'll share a step-by-step guide on how I did this. If you haven't used Python before, have no fear—this is definitely achievable for novices. Read on! Some context before I begin: I have limited experience with Python. I recently completed a challenging but great course through edX that I'd highly recommend if you are looking for foundational knowledge. The syllabus included advanced Python including classes and thinking about algorithmic complexity. I have a Mac. If you're trying to reproduce with a PC, you can find install instructions here. Now if you're like me and you're not successful on your first try, it may be because you have Python 3.0 and not the required Python 2.7. Or you might have both versions, but your primary is the 3.0 version. This is what happened to me as I had Anaconda previously installed (it's part of the TabPy download) and had been using Python 3.0 for the class I took. Now it's time to setup your TabPy in Tableau. In Tableau 10.1, go to Help > Settings and Performance > Manage External Connection. Enter "localhost" since you're running TabPy on your own computer. The default port is 9004, so unless you manually changed it, you should leave it at that. The TabPy Github page has extensive documentation you should review on using Python in Tableau calculations. I simply repurposed one of the calcs they demoed during the TabPy session at #data16. Catch the replay here. Everything following # is a comment just to help make sense of what the code is doing. Feel free to remove that text. Unfortunately, you cannot publish vizzes using TabPy to Tableau Public. If you want to download the .twbx version I made using TabPy, you can do so here. However, you could run this analysis outside of Tableau and simply import the output and create your viz that way. I did this which also gave me more flexibility with LODs since I was no longer using TabPy. TabPy definitely took me less time and required less code. Below is what the code would like like outside of TabPy. You can run this code in a Jupyter notebook or another IDE. I used Spyder only because I used that for my class. You can download my Tableau Public viz which uses the output of the below code to inspect further! For more tips, ideas, and vizzes by Brit, check out her Tableau Public profile page and her blog. You can also connect with her on Twitter @DataBrit. Makeover Monday fans, join us on Monday, Dec. 19 for a #MakeoverMonday Twitter chat! Hosts Andy Cotgreave and Andy Kriebel will kick things off at 4 p.m. UTC. I installed the latest Tabpy version in my OS (win7, Tableau Version 10.2.0). The installation was successful and the "Tableau-Python-Server" instance was created. Just after the installation the server started itself without problems using the startup.bat script. Now I am having the following issue, when I open tableau or a workbook in Tableau with Python code I am not able to create a connection, I am following the steps described in the Github documentation, but I keep getting the same error. "The external server is busy or not responding". I did not see any errors while installing Tabpy, and the server seems to be running. What could be the problem?